First post for a while eh? Well not much has changed in Southanuk, its still 10 and as usual, I’ve forgotten to post for ages. Recently I have acquired a very nice little TV/Monitor for my room. 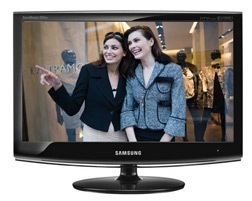 The monitor in question is a 23 inch Samsung 2333HD. A very nice sized TV with a modest array of inputs (Its technically a monitor so I shouldn’t moan.) My one very big quibble is the sound with the inbuilt speakers. Now I wasn’t expecting much in the way of sound but there is absolutely no bass whatsoever on these speakers. Luckily I had some old PC speakers laying about so I just plugged those in instead, hey presto, bass. I must say having the option for 1080p is very handy with me having a PS3 and all, however, the majority of PS3 games are only 720p max. So until Sony make it mandatory for all games to be 1080p max I’ll have to enjoy 720p games. Saying that, some games are 1080p like LocoRoco Cocoreccho.